Google announced on Tuesday that it is rolling out “Search, plus Your World” format, which fully integrates Google+ and personalized search for logged in users. Google Fellow Amit Singhal detailed the adjustments in a post on the company’s Inside Search Blog. The three primary features added to search are “personal results,” “profiles in search” and “people and pages.” Each is aimed at providing searchers with results tailored entirely to their preferences. Data from their Google+ and other accounts on the company’s services will be used to assemble SERPs. While personal search results and filters have been live to varying degrees for years, the most recent changes have major implications for marketers leveraging SEO and content marketing campaigns. The new format creates SERPs that are visible only to individual users, as they are partially based on the information found in his or her Google+ and Picasa profiles. The personalized SERPs will include general top SEO web listings, results with preferential ranking because of a user’s activity, results with preferential ranking because of social connections (presumably Google+), related Google+ or Picassa posts that are open to the public and Google+ or Picassa listings available to the user. For marketers, the inclusion of personal results amplifies the significance of social media marketing substantially. Encouraging users to share content has essentially become as critical as any other piece of social strategies for businesses using Google+. Those resistant to using Google+ may want to reconsider as the platform is now so tightly woven with Google search. Moreover, Brafton recently reported that 77 percent of the top 100 global brands are now active on the platform. 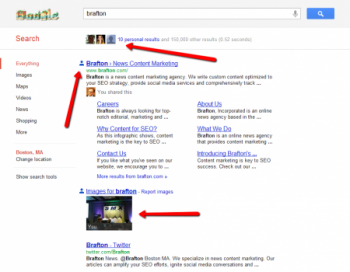 Profiles in Search is another addition that places a greater emphasis on Google+ as part of search results. 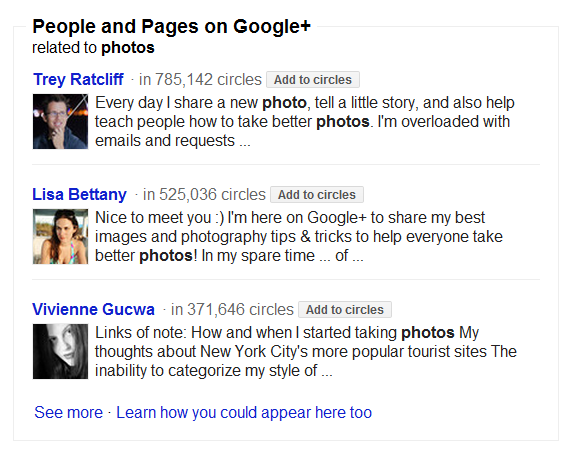 Users searching for author names or other prominent people will find Google+ profiles most likely to match their search based on their connections or other G+ users’ prominence. Logged-in users will be able to add the person to his or her circles directly from the SERP, building on the company’s previously released feature that allowed News readers to add authors to their circles straight from News SERPs. The final adjustment is, more than anything, aimed at encouraging discussion and engagement on social. While it doesn’t seem to be available for social media marketing solution Google+ Pages yet, People and Pages allows users to find the Google+ accounts of prominent community members based on a specific topic. Singhal uses the example of “music,” which yielded the profiles of popular recording artists, such as Britney Speaks, Alicia Keys and Snoop Dogg, in the right sidebar of the results page. Users can add these people to their circles from the SERP and see the profiles of others noted for that specific topic. Users can easily toggle between personal results and their usual SERPs with a pair of buttons in the top right of the page, but it’s clear that Google is intentionally blurring the lines between search and social results. For Google+, consistently rolling out new features and boosting visibility is critical if the platform hopes to continue gaining traffic. Brafton recently reported that Google+ now has more than 62 million active users, a quarter of which signed up in December 2011 alone. Of course, there may be other social networks included in the Search, plus Your World mix, soon. As Brafton has reported, Google recently called for other social sites to share activity information for inclusion in its off-site engagement analytics features – and it might want to factor this data into personalized SERPs.